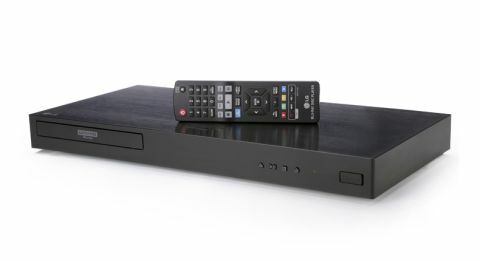 LG UP970 4K Blu-ray player review | What Hi-Fi? There’s a quote, usually attributed to Albert Einstein, which goes: “Light travels faster than sound. This is why some people appear bright until you hear them speak”. That’s how we feel using LG’s new Blu-ray player, the UP970. While its video quality is pleasing, it could sound better and so, ultimately, isn’t as complete as we’d like. While some manufacturers like their kit to be smooth boxes of unblemished darkness (the Sony UDP-X800, for instance) others like a bit of personality and detail. LG’s UP970 sits in the second camp, with four raised buttons on its front for power and playback. There’s also a neat USB 2.0 input on the right, for playing videos and music or connecting your Android phone. Around the back you’ll find all the expected ports: an optical connection, two HDMI outputs and an ethernet port for a more stable network conection. Setting up the player is simple enough. There are a couple of settings for adjusting picture quality and output resolution in the LG’s straightforward menu screen, but nothing out of the ordinary. Unfortunately you don’t quite get the range of streaming services you do on some other players. Only Netflix and YouTube are available on the LG. That shouldn’t be too much of an issue, though – most 4K HDR televisions have a great range of video services already installed. One thing the UP970 does have is Dolby Vision integration – a proprietary HDR technology from Dolby. Similar to HDR10, it differs in that it has ‘dynamic metadata’ which means it can adapt its image frame-by-frame, theoretically rendering each shot optimally. While there are currently no Dolby Vision Blu-ray discs, Lionsgate, Sony, Universal and Warner Studios have promised releases later this year. But you can get Dolby Vision content on Netflix – including its Original Series programmes like Daredevil, The Ridiculous 6, and Marco Polo. Sony, LG, and Loewe have all made Dolby Vision-compatible televisions, but if you don’t have a set from those companies, don’t worry – the UP970 will still play content in standard HDR10. That said, we did have an issue playing HDR content when connecting the UP970 to our Samsung UE65KS9500. While the HDR pop-up appeared, indicating that it was playing, the picture was significantly less colourful than we expected. We’re as yet unable to establish whether this is a shortcoming with the TV or the Blu-ray player, but there’s undoubtedly an issue that needs to be fixed. Once it’s working, the picture from the UP970 is really pretty good. We play a Netflix stream of the naturally bright and punchy Wet Hot American Summer: First Day of Camp, and the UP970 is happy to put across the vibrant parody of camp life. There’s an impressive range of hues in the clear water of the lake, contrasting nicely with the surrounding greenery. The skin-tones of the campers are balanced pretty well, highlighting the differences between the pale nerdy kids and the tanned, athletic jocks. The dark scenes are done just as well as the bright, with enough detail and colour variation to keep you drawn in. During Stranger Things, when Nancy Wheeler gets momentarily trapped in the ‘Upside Down’ – a slimy, shadowy world that’s home to at least one grotesque monster – there’s a good deal of detail to the fluffy collar on her jacket - and you can see both the gnarls and the ooze that lines the bark of the trees. Even the near-silhouette of the monster, which is lit to look as indistinct and threatening as possible, has areas of lighter grey to its otherwise black body, revealing its ridges and hinting at its teeth. These characteristics remain when you switch down to a standard Blu-ray of Captain America: The Winter Soldier, and the player doesn’t struggle to render the deep purples and pastel blues of the morning sky. The UP970’s upscaling abilities are decent as well, providing enough detail in Steve Roger’s costume. We take another step down in resolution with a DVD of Die Hard 2 and there’s an expected drop in detail, but it remains a watchable picture. But regardless of format, when compared with the Sony UDP-X800 the UP970 comes second. Not by much, mind, but by a noticeable amount. We play Planet Earth II and there’s a touch more detail to the Sony that means the fur of the snow leopards is more textured, the distinction between the foreground and background of the mountains clearer. The colours are slightly more natural on the UDP-X800 too. When it comes to sound performance, the UP970 falls short of its competition. There isn’t enough dynamism and drive from the LG to really deliver the energy in tense soundtracks. During Hancock, as the superhero walks across the street as a reformed character, the proud trumpets and hefty drums signifying this transformation are a bit weaker than we’d like. We change to Ghostbusters (2016),and when the spectral visage of Gertrude Altridge floats into the room, the high-pitched strings welcoming her entrance are smooth and without any harsh edges - but there isn’t the same texture to the squelching bass sounds you get from the X800 when the ghost vomits. It’s not a bad sound, but it has some way to go before it matches the competition. The UP970 is a good player. Its picture is pleasing, and its audio quality (for all its flaws) is still decent. But it’s up against some properly tough competition from the likes of Sony and Panasonic, and our money would go to one of these. There are still improvements to be made before we can wholeheartedly recommend this one.